A fantastic walk exploring the limestone scenery of Kingsdale including a trio of impressive pot holes and a visit to the superb Yordas Cave. 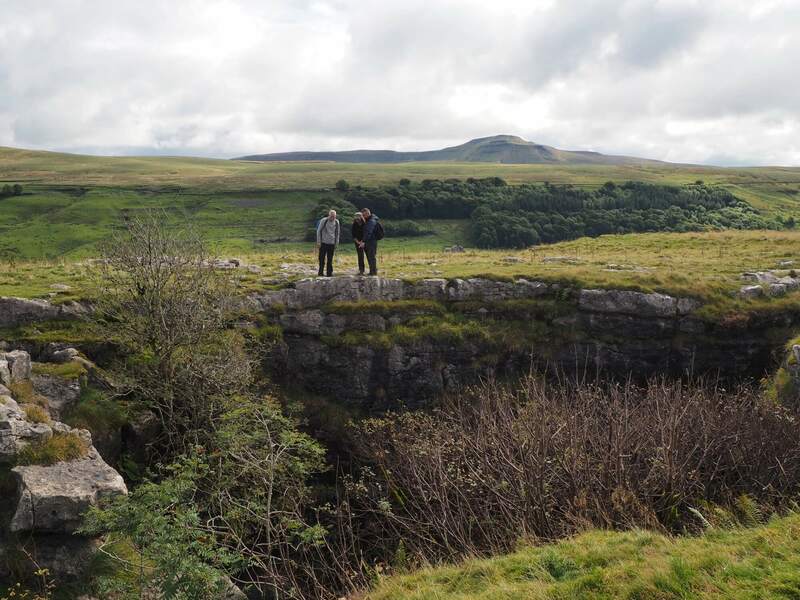 Kingsdale is one of the lesser known dales despite the fact that it is seen by just about everyone who walks the popular Ingleton Waterfall Trail. Indeed it is Kingsdale Beck, in its later guise as the River Twiss, that plunges over Thornton Force and Pecca Falls. However, it is not waterfalls that draw visitors to Kingsdale, but instead its caves and potholes. This route, similar to a walk I’d originally done in November 2008, visits most of the best known sights in Kingsdale. The walk started from a small roadside parking area at the brow of the road from Thornton in Lonsdale, just before it drops down into Kingsdale. Alongside the parking area is a gate and we passed through this for a steady climb on a broad green track. A few minutes after passing through a second gate we made a detour up to the left to visit the trig point on Tow Scar. Visibility was excellent with individual features such as Heysham Power Station on the Lancashire coast clearly seen. Nearer to the south several showers could be seen heading towards Ingleton. Returning to the path we followed it a short way until, after climbing on to the southern end of North End Scar, we took a thinner path on another detour. This time we made our way south to visit the giant limestone boulder known as the Cheese Press Stone. The rock is superbly situated with grand views of Gragareth, Whernside and especially Ingleborough. Back at North End Scar and the main path we followed the latter towards Gragareth unti arriving at another track alongside a wall. Turning right on this we were now on the Turbary Road. Turbary is the legal right to cut turf or peat, usually as a source of fuel. While the Turbary Road would once have been used to access peat its most striking features today are a series of impressive potholes close to the path. The first pothole we came across was Kail Pot. This is located to the right of the path not long after it passes through the first gate. Sensibly fenced off, Kail Pot is almost covered in ferns and other vegetation which makes approaching it too closely rather foolish as it is difficult to see the ground beneath your feet. It can still be appreciated from the safety of the other side of the fence even if a stile does tempt a closer look. Continuing on through the next two pastures we saw a couple of smaller potholes. None of them compared however to the beast awaiting us in the third pasture – Rowten Pot. The first intimations of something impressive was the sound of water rushing beneath a pot hole next to the path, this deep and dangerous hole is itself part of Rowten Pot. Twenty metres or so further on was Rowten Pot itself, one of the most impressive pot holes in the Dales. After carefully walking around the edge of the pot hole we continued on where I made another detour, this time to visit Jingling Pot. The latter is a slit in the ground below a tree. The shaft may be narrow but it is very deep and as with all the holes in the ground in this area require a great deal of caution when approaching. In the next pasture the path began to climb steadily uphill until coming to something of an impasse at some corrugate metal covering a gate. Without attempting to pass through we turned right to walk downhill. On arrival at Shout Scar we managed to carefully climb over the wall and fence on our left to then slant down to reach a path that led us to Yordas Cave. Once a Victorian show cave, Yordas Cave is now much less well known and yet it is one of the easiest and finest caves one can visit in the Yorkshire Dales withouth paying for the privilege. On my first visit I’d carelessly left my head torch at home. Having made sure everyone had a torch with them this time we entered the cave. Unfortunately, the amount of rain over the previous week meant that there was a fair flow of water across the main chamber. Even with our torches it would have been wet and slippery work to investigate too far. This was frustrating as I really wanted to see the waterfall at the back of the cave. Just to rub things in a party of cavers entered not long after us with wellies, helmets and head torches to show us how it should be done. While it was disappointing that we couldn’t explore too much everyone still enjoyed the excursion into the cave. Upon emerging into daylight the sun was out so we decided to stop and have our lunch. It was supposed to be a day of frequent showers but thus far we’d gotten away with it. Not for much longer though. After we’d eaten our lunch we dropped down to the road, turned right and began heading down dale. Behind us some ominously dark clouds were appearing over Kingsdale Head. It soon caught up with us and by the time we reached the footbridge over Kingsdale Beck we all had our waterproofs on. Thankfully the shower didn’t last too long, indeed by the time we’d crossed a couple of scrappy pastures to reach Braida Garth, it had gone. We were greeted at the farm by a terrier who had clearly had pups recently. The mother was soon joined by one of her pups who both accompanied us through the farmyard before seeing us off in the next field. The next section, from Braida Garth to Scar End, was awkward underfoot. The path was narrow, damp and in places reedy. Most inconveniently though it had also been badly churned up by cattle. On the other hand the cows were all safely in the lower fields so that was a bonus. Finally reaching Scar End we dropped down to Twistleton Lane and the ice cream van that caters for the crowds on the waterfall trail. We just managed to fit an ice cream in before the clouds began to gather again. Indeed almost as soon as we crossed the River Twiss at Ravenray Bridge it began to rain again. Fortunately it was just a few minutes walk back up the road to the car. We all thoroughly enjoyed this walk. The views were first rate and there were numerous features of interest. Now that I know wellies are a must in Yordas Cave I’ll hopefully be back there again soon. Next time I think I might include a visit to Gragareth as well.